It's a confusing time of year. Dana Sippel, with Glassman Wealth Services, swung by the WTOP newsroom to answer some your most taxing questions. It’s that time of year again. Tax season. Whether you’ve already finished your return, or are still waiting for that refund, or you still haven’t filed, tax season can be a confusing time. That’s especially true if you work a nontraditional job or operate a small business. Dana Sippel, with Glassman Wealth Services, swung by the WTOP newsroom Tuesday to answer some of your most taxing questions. Q: Some people are noticing their reimbursements are smaller than last year. Why is that? A big change from last year is a lot of itemized deductions have gone away. State and local taxes are now limited to $10,000 for a married couple, for singles, and a little bit more for head of household. Also, miscellaneous itemized deductions that included things such as tax prep fees, investment advisory fees, legal fees … all those are gone, too. It was part of the new tax change. They were just nixed, for lack of a better term. Q: Itemized deduction vs. standard deduction? Interestingly, on that … in prior years, we had about 30% of people in the country itemize. It’s expected to be down to somewhere around 10% for 2018 and beyond. Because of the fact that the standard deduction has effectively doubled for everybody — and the limitations on state and local taxes — means that if you don’t get over that threshold, then it won’t pay to itemize. Q: What filing status should I use? You’ll want to take a look at both filing statuses. So, if you’re using some sort of a tax prep software, which most people use, it will lead you through that. Otherwise, you’re going to take the higher of — it’s $24,000 for a couple filing jointly and $12,000 for a single. So, if your itemized deductions don’t exceed those numbers, you’re going to take the standard deduction. Q: How should I update my withholding so I don’t have to owe next year? The IRS has a withholding calculator. If people haven’t done that, they can go to the IRS website and pull this up and it will help walk them through that. 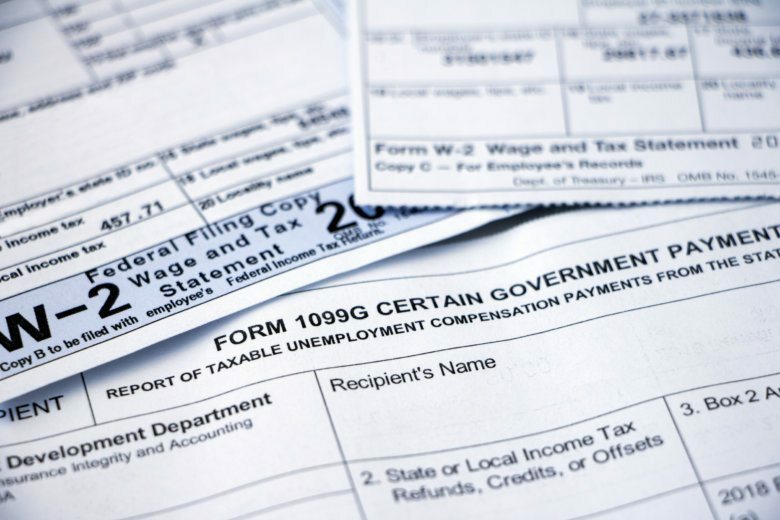 But they also might have other circumstances where they have, say, more investment income or they might not be working a regular job where they have W-2 employment, where they’re having taxes withheld. We have more and more people now in the gig economy that are Uber drivers or Instacart delivery people, or you name it. Those people have to pay estimated tax payments. So, in that case, they’ve got to do a little bit more work to figure out, “What’s the best estimate … and pay my taxes?” So I think those are two things to look at. Either 1) adjusting your withholding or 2) if you’re making estimated tax payments, you’ve got to look into how to estimate those best so that you are closer to where you’re going to be. Q: What about small-business owners? One more thing that’s a big item for this year is the qualified business income deduction that affects people that have small businesses. That can be a huge benefit. It’s generally 20% deduction. It is subject to income limitations, but for people that have small businesses, they want to make sure they work with an accountant on that. It’s really difficult to figure out all the different pieces of it, but it can be a worthwhile deduction, essentially reducing your business income by 20%. So that is very worthwhile for people with small businesses. And these people that are in the gig economy — the Uber drivers and Instacart people — are considered small businesses. Even people that have some involvement in real estate activities. (The income cap) is generally phased out between $315,000 and $415,000 on a married return. There are a number of other limits that get involved, too. So it’s really complicated in terms of trying to go through that, but it is worthwhile. That deduction is meant (to) equalize. They brought the corporate tax rate down to 21%, and what they did is they put in this qualified business income deduction to try to level the field between, say, the big companies like an Apple or an IBM to a person who is running a dry cleaners or restaurant or something like that. Q: What about people who work for tips? For those people that are working under tips, they usually get some small wage. Sometimes it’s none, sometimes it’s a small wage where there might be some withholding. But yes, the majority of their income would probably come from tips, which are not normally withheld for taxes. Q: What is the best way to estimate that income? That’s a challenging situation. It requires a little more work to go through that. … We’ve got an article on (Glassman Wealth’s) website that talks about how to estimate your taxes and walk through that. But it definitely requires more legwork in terms of trying to figure out what your tax will be. To elaborate a little more on estimated taxes, you’ve got to pay taxes April 15, June 15, Sept. 15 and Jan. 15. You’re supposed to pay a quarter of your liability in each of those times. And you can estimate as you’re going through the year, like, “What have I made for the first quarter? Second quarter?” So you can break it down into pieces, and that might be a little easier to figure out (what your taxes are). The other thing to consider for people who are doing that is they also have to pay self-employment taxes. So the Social Security and Medicare taxes that are normally withheld and paid by your employer, you have to cover completely when you’re self-employed. You have to cover both sides of that. So in addition to your federal and state tax, you’ve got the social security and the Medicare taxes. So they have a higher burden that they have to estimate for. Q: Got any tips to start planning for next tax season? I would take a close look at what happened this year, if you finished your return. If you didn’t like the outcome, I would say check your checks — in other words, your withholding. Bunch your deductions. If you didn’t itemize this year, there are ways to bunch up your charitable deductions, bunch up possible medical tax payments and things like that. So some of those you can pay at different times so you can kind of lump into one year so you’ll get over that threshold and be able to itemize, say, maybe one year out of every two or three. That can help. The third thing I would say is top up your retirement accounts. If you’re not saving into an IRA, your 401(k), your thrift savings plan, think about putting more money into those. Those are usually tax-deferred deductions and those can be helpful to reduce your tax burden.